Oddsocks Productions’ winter show this year is a new version of the outlaw legend, a story familiar from countless retellings, both played straight and in spoofs. All the familiar elements are here: the evil Sheriff, the Merry Men, Maid Marian, the archery contest… but given the Oddsocks treatment. The broad humour, wordplay, innuendo are all here with a lavish coating of slapstick and physical comedy. There is music of a folk nature (composed by Lucy Ward) and of course, a couple of puppets put in an appearance. This was the first ever performance and at times this was more obvious than others. The set is ingenious, intricate and versatile but brings with it certain drawbacks, making some of the transitions less than slick. In time, these will speed up and, when the script is embedded and the quick changes better organised, the show will run like clockwork – although, to be perfectly honest, the delays, the missed cues and the wobbly walls add to the fun. Oddsocks can get away with it; their enthusiastic brand of knockabout silliness allows for the wheels to come off from time to time. The cast of five play multiple roles, forming a likeable ensemble working their (odd) socks off to keep the balloon aloft. Kevin Kemp is the titular hero. This Robin is not an aristocrat gone wild but a man of the people. His nobility is of the down-to-earth, working man variety. Kemp is also hilarious as long-serving dungeon occupant Obadiah, complete with stretched limbs and silly beard. Maid Marian is played by Oddsocks newcomer, Louisa Farrant, a classy beauty not shy of plain-speaking and who plays a mean flute. Joseph Maudsley stalks around on stilts as a not-so Little John, and also has a bash at a Bishop. Andrew McGillan is Friar Tuck and Will Scarlet, throwing himself around. They are all very, very funny so I won’t pick a favourite. This hard-working, energetic and merry band is led by writer/director Andy Barrow as the evil Sheriff and Much the Miller’s Son in a ratty mullet. Barrow hams it up with relish and the script shows his mastery of humour in all its forms. This is good old British comedy, stemming from the likes of The Goons and Round the Horne but there are also hints of the Three Stooges in the slapstick and Abbot & Costello in the double talk. The man knows how to make you laugh. This is Oddsocks’s most physical show to date. There is plenty of sword play and stage combat (choreographed by Amed Hashimi) that doesn’t repeat a gag, and there is a lot of coming and going to serve the contrivances of the story. I was struck by how political the show is. 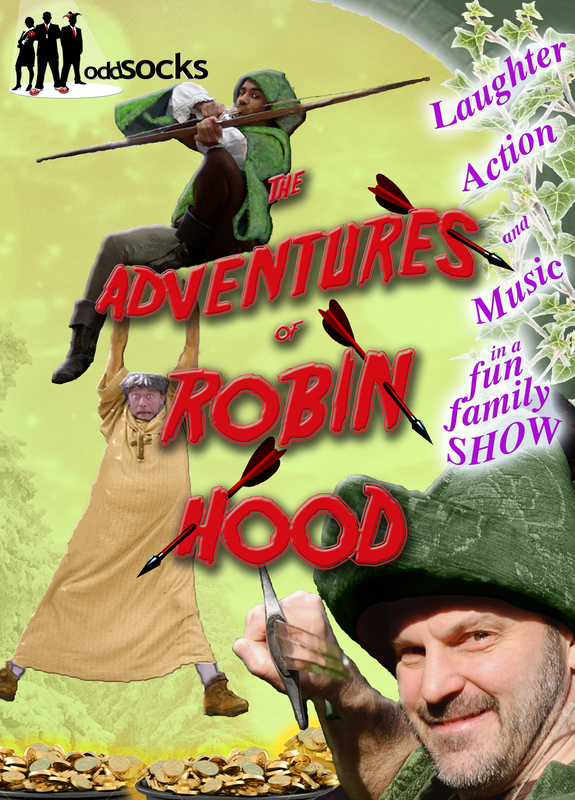 Robin Hood is a political figure, always has been, but here, with bang up-to-date topical jokes and obvious parallels to the rich who are getting rich off the backs of the poor, the play calls us to action. We all have to be Robin Hood if we are to overcome the exploitation we face. There is a lot about public officials serving the law rather than being above it. This colourful production (wonderful costumes by Mike Lees) shows us the issue can be as simple as black and white, right and wrong. I am certain as the tour carries on, the organisation will improve and the performances will be slicker, and I really liked the darker moments when it all goes dramatic. Apart from one: the Sheriff’s first scene. He goes straight into his dramatic exposition and we sit there waiting for the chance to boo him as we have been warmed up to do in the prologue. An insult or even just a sneer to the audience as he walks on would allow us the opportunity. As it was, our boos were a long time coming, because we were focussed on the storytelling. The moments of audience participation are good fun, and the volunteers rose to their scenes with aplomb. On the whole, I believe everyone had a good time. Even the briefly shambolic moments were enjoyable! Would I like to revisit this production a few weeks down the line?